I recently discussed Della Farrant's comments on Kai Roberts' write-up of the Highgate vampire case. She took issue with the coverage Roberts gave to David Farrant's 1970 trial for being in an 'enclosed area for an unlawful purpose', i.e. intending on breaking into tombs [to stake a vampire] at Highgate Cemetery. I contrasted her criticism—'. . . when referring to David Farrant’s arrest for ‘vampire hunting’ in 1970, Kai omits a crucial point. David was, as everybody will remember, acquitted of this charge. The charge itself was being [caught] in an enclosed area for an unlawful purpose'—with what he actually wrote, and quoted a relevant passage. Kai was apparently misinformed when he summarises that David was acquitted on 2 technicalities, namely the definition of an enclosed area, and the fact that it is not actually illegal to hunt a vampire. This was not in fact the case. The main indictment in that case was the element of unlawful purpose. That was the only reason David was arrested by police who attempted to persuade the court that his purpose was to break open coffins in search of the reputed vampire. The police evidence (again given under oath) was that David had later told the arresting officer that he intended to drive a wooden stake through the vampire’s heart and then ‘run away’ . . . However…David denied making this statement, in court, and the stipendary [sic] magistrate obviously did not believe the police evidence and so the unlawful purpose element was thrown out of court. The conclusion is clear: that David was not acquitted because it is not illegal to hunt vampires, but because the court did not believe that he was trying to do so in the first place. To inadvertently misguide the reader over this important point is regrettable, as it contrasts sharply with many of Kai’s other points which he has investigated thoroughly. As a matter of interest, the title “The Highgate Vampire” first appeared in an article published in connection with myself in the London Evening News on October 16th 1970. This headline ran “Midnight Vigil for the Highgate Vampire” [sic] and followed a BBC television transmission the evening before which featured myself and my investigation into a ‘vampire-like figure’ that had been sighted in and around Highgate Cemetery. Fortunately, Kev Demant's website provides a full transcript of the vampire segment. Instead of an 'investigation into a "vampire-like figure" that had been sighted in and around Highgate Cemetery', the clip features a much more literal rendering: 'Now, in spite of all attempts by the cemetery owners to bar him Farrant and his friends still maintain a regular vigil (of the ?) catacombs in the hope of sighting either the vampire or the Satanists.' Not the first time Farrant's commentary on contemporary coverage doesn't tally with what's represented. That said, the Simmons article appears to be the first public source to confirm Farrant's unbelief in vampires. At least in 'the commercial sense of the word'; mainly because Farrant clearly believes in a different type of vampire. This explains why he repeatedly emphasises 'bloodsucking vampires' when ridiculing Manchester's account; to take the heat off his own vampiric allusions and publicity-seeking antics. Perhaps Della's critique should've been asking: who was 'inadvertently' misguiding who? However, little has been provided in the way of evidence—no witnesses are named; no photographs shown. Indeed, it's difficult to determine how this rumour began. About the best 'proof' I've seen for Manchester's Right-wing sympathies was his involvement in the 'phoney Nazi scandal'—covered by Kev Demant—and his plagiarised blog entry about US President, Barack Obama. The subsequent cover-up didn't help Manchester's case, either. Sean was a fellow lifeguard and we became friendly. The season at Finchley ended in September and the pool closed. Sean went back to his milk round, but he was sacked and reinvented himself as Lord Manchester, attempting to take candid photographs of passers by, and accosting them for money. He was pitched up on Holloway Road next to a newspaper stall run by a friend of his, known locally as the Eggmane.1 Sean was told by the police to cease this behaviour on pain of arrest; he then came to me (I was now working at Hornsey Road Public Baths) asking if I could get him a job as a lifeguard. He [Sean] was a great coach but a hard taskmaster. If I was not training hard enough he used to shout "Schnell, schnell ...dummkopfen English, eggs and bacon Englishman”, and when he really got angry..."You vill be shot at dawn"... At the time, I thought it was just his strange sense of humour, although I did find it somewhat disturbing, and it was certainly embarrassing as he often shouted this sort of thing in public (at that stage). but I do remember that often, just when the conversation was being diverted away, he would find some reason to slip in one of his favourite Goebbels quotes; that is: "If you tell a big enough lie and keep repeating it, people will eventually come to believe it." I never had much interest in the vampire business by which Sean made his name, but I do recall that whenever he used this phrase, even in unrelated contexts, he and Eggmanne would smile and exchange knowing looks, which made the rest of the party feel rather left out and uncomfortable through their ignorance. Joseph Goebbels (1897–1945)—for those not-in-the-know—was the Minister for Propaganda under the Nazi regime and 'one of Adolf Hitler's closest associates and most devout followers'. He boasted about the list of aliases inscribed upon it, and how he used them regularly in a form of cyber warfare, in that, as he described it, he would search the internet for any forum which mentioned himself, David Farrant, or the Highgate Vampire. His modus operandi as he described it was to create an argument, then argue against it under up to 4 or 5 aliases until the conversation got so heated that the forum was closed down. At this point, you might be wondering why Chesham still chose to remain friends with Manchester, if these allegations hold water. According to him, the turning point came when he and his wife were visiting Manchester for Christmas dinner in 2007. While there, they were invited to a 'locked room upstairs' and—take a look at the photos in Chesham's extract. You'll see for yourself. As of this writing, Manchester hasn't commented on Chesham's allegations, but is certainly aware of them. But a blogger named 'Steatoda Nobilis' has risen to the challenge. 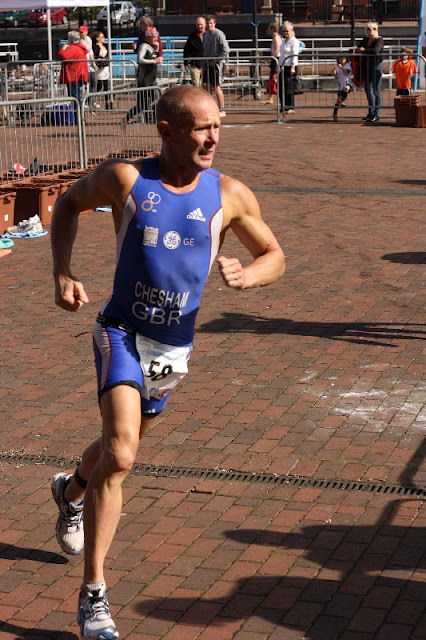 Previously known for their blog, Friends of David Farrant, a compilation of photographs publicly identifying many of Farrant's alleged friends—many of which have been cribbed from Facebook pages—recently created a blog called Kevin Chesham — Triathlete (not to be confused with Chesham's blog of the same name). It is frequently revised, but clearly intends to give the impression that Chesham, himself, has—or had—fascist sympathies, too. The anonymous blogger's counter-'evidence', however, is flimsy at best. For instance, one entry states, 'Kevin Chesham paying homage to Adolf Hitler in Berlin, a place he has visited many times', but the only 'homage' shown, is Chesham standing next to a picture of Hitler. Interestingly, the blogger suggests a personal familiarity with Chesham, even though no such thing is disclosed in their profile or in the blog. Apart from reproducing pictures not found in other online sources, Nobilis is even able to provide dates ('Kevin Chesham posing in a blackshirt alongside Third Reich militaria in 2003') and reproduces a letter allegedly written by Chesham in 1998. Unfortunately, many of the images are tainted by Nobilis's horrible 'photoshop' skills. Interestingly, Nobilis' profile mentions spiders of their genus are 'have a reputation for biting people, although in truth, this is quite a rare occurrence', adding, 'You would need to be very unlucky, or go out of your way to be bitten. They only bite if mishandled or provoked.' What Chesham—or Farrant's friends, for that matter—have done to 'mishandle' or 'provoke' Nobilis, remains unclear. He has militaria from medieval times right up to the two world wars. From what I can see, there is little space given to 20th century militaria by comparison to previous centuries of similar material. Anyone visiting would obviously know that, and pictures taken in most of the larger rooms (which he has uploaded) show the 19th century predominating. This doesn't explain the silver frames surrounding a picture of Adolf Hitler and an article titled 'One in four Germans admires the Nazis' (Daily Mail, 18 October 2007). Nor does it explain the prevalence of Nazi paraphernalia or books. Hästehufvud's idea of a 'little space' is an entire wall and bookshelf crammed with writings about der Führer; mingled with works on vampirism, horror and the occult, no less. In that case, you gotta wonder why Manchester's name appears here, especially as he's also the patron of The English Society, which was 'Inspired by a love for English culture, language, history, heritage and Christian Faith with a sense of pride in all that is unique and wonderful about England and the English people', and lined with alarmist articles. According to Raggety's comments on Chesham's extract, the final work will be 'a free E-Book', although a publication date has not been set. 1. 'Eggmanne' [sic] is mentioned several times in Chesham's extract. I'm not sure why Chesham sticks to the pseudonym, as 'Eggmanne''s identity was already established in Seán Manchester's The vampire hunter's handbook: a concise vampirological guide, Gothic Press, London, pp. 62–3: Tony Hill [Anthony Arthur Robert Hill]. The book is also cited on Manchester's Holy Grail Church website. See: http://www.holygrail-church.fsnet.co.uk/FarrantFacts.htm.